Lots of people dislike birds, especially if they’ve lived in cities alongside pigeons. Not me. I was 9 years old when we got two parakeets. I loved the symmetry of their feathers and colors, their graceful flight and how daintily they cracked and ate seeds. I patiently trained our birds to perch on my finger, to shower under the trickling kitchen faucet, and to sit on my shoulder for kisses (and often to nip or poop on me). I was delighted with our birds, one green, one blue and both named Billyboy. I never questioned their single name or where it came from. Someone in our immigrant family likely heard it was a genuine American bird name. And Billyboy they both were, as were subsequent generations. Over the next couple of years, the Billyboys and I harmonized with the radio’s top 40 hits and shared heartfelt chirps and gentle cuddles when I felt blue. There was caretaking involved, daily feeding and water changing, cuttlebone treats for beak-cleaning, and rinsing and rehanging of cage toys. It was the cage cleaning that irked me. Seared in my memory is the afternoon my 3-year-older sister Evie and I were charged with cleaning the cage. Our parents were tending their little grocery store as they did 14 hours a day. The open windows beckoned me to go out and play on this beautiful day. Methodical Evie was painstakingly sliding out the metal shelf at the bottom of the cage to change the newspaper lining. In my impatience I lifted the cage up to hasten the process. Blue Billyboy, no laggard when opportunity arose, dipped down out of the cage, and soared out the window into eternal freedom. Suffice it to say I cried many tears and suffered guilt for months. In my teens we acquired more Billyboys, one of whom revealed herself as Billygirl. When she began exhibiting motherhood signs we connected a wooden hideaway to the cage. Billygirl nested on the straw filler, waiting for the big event. Then, on peeking into her refuge on Mother’s Day morning, I found her lying sideways. She had crossed to parakeet heaven in the midst of passing an egg. It was a heartbreak for us, especially my mother, who wanted no celebration that day, and no more birds. In adulthood, cats entered my life, forcing me to limit my fondness for birds into a back yard birdbath. Word of fresh water and shallow depth spreads quickly in the avian world and I enjoyed nature on the wing through my kitchen window. Between my bird feeder, and occasional bread, I attracted various species and sizes of birds. Although widely reviled as much as pigeons, I particularly liked watching crows. They appeared very communal, never behaving aggressively with each other. Whenever there were vittles they cawed for their mates to fly in and share. They also planned ahead, stashing food in vines and between palm fronds for another day. Then, in spring, the carnivore landed. At first, I was delighted to see the same shiny bluish-black crow return multiple times a day. I rejoiced as it bathed. This bird busied, engaging beak and claws, delivering and dropping things in the bath, with a great deal of pecking and thrashing about. The water quickly grew murky and strange things floated about. First were large moth wing parts, likely from a recent abundance of wolf moths. Then, a flotilla of dainty dun-colored feathers. As the days progressed, organic matter showed up. It was then that bird bath maintenance transferred to my husband. He hosed, he scrubbed and, in exchange for his labor, he insisted on enumerating the findings – parts of mice, rats and birds. I was appalled. My anthropomorphizing didn’t allow for this. Was this normal crow behavior or a phenomenon? Was my avian Hannibal Lecter, a predator of live animals, or an opportunistic carrion eater? Naturally I turned to the information superhighway and Google. 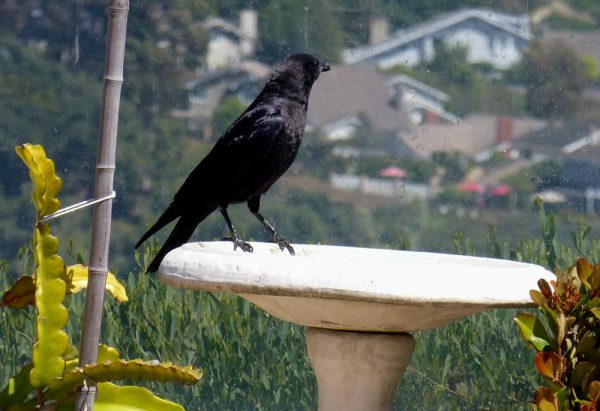 “Why is a crow bringing dead things to my bird bath?” I asked. Most responses were jocular and disgusting until I came to a Cornell University site: http://www.birds.cornell.edu/crows/crowfaq.htm#birdbath. I read that my crow was normal and possibly a good partner caring for a nesting female breeder as she sits on eggs or nestlings. I began to admire my crow. After all, Hannibal, an omnivore, was a valuable cog in nature’s immense dining hall. He ate most anything including aged and marinated meat, much like my filet mignon-loving friends. Pondering HannibaI’s nature, I fondly recalled the pampered life of my music-loving, faucet-bathing, hand-fed Billyboys. In contrast, billions of Hannibals are endlessly on the wing for food, shelter and safety. Being another cog in nature’s wheel, I’ve made a deal to accept Hannibal’s vagaries and keep the bath clean and filled. FYI Sara, my grandmothers parakeet was also named Billy Boy. Mine was the unoriginal Tweety. Lovely story ….brought back memories of the old days before we all flew the coop and went our own way. so nice to hear from you all and that you enjoyed the story. the bird is the word! Eventually, he “inherited ” a dog. It was a true love story. Congratualtions on your book. Available on Amazon? Sandra, thank you for sharing and the kind comments. i haven’t quite gotten around to publishing my Seven Deadly Sins but I will, hopefully sooner than later.